A couple of days ago we covered claims from Italy which stated Jose Mourinho is ‘convinced’ about an eventual Manchester United transfer for Joachim Andersen, after the club received a raft of reports from following the defender at Sampdoria. Since then Andersen has extended his contract by a year and received a pay rise. But despite the smiling pictures holding a shirt with the year 2022 on it, the Italian media aren’t convinced this is much more than a way for Sampdoria to get the best possible price for the player. 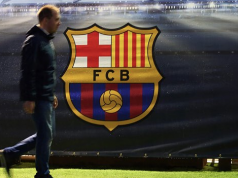 Manchester United interest is referenced once again by Gazzatta dello Sport on Friday, along with that of Tottenham. It’s the Red Devils getting more column inches, and once again Mourinho is presented as leading a potential chase for Andersen. The manager is said to have seen in Dane the ‘potential to become a world class defender’. 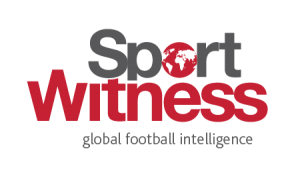 That’s why the Premier League club are keen and have set their sights on signing the player, and also why Sampdoria know they can get a big fee when the time comes. 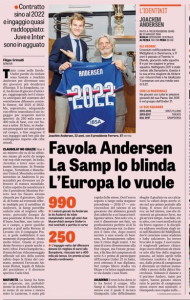 No clause has been put in the 22 year old’s new contract, and Gazzetta dello Sport explain that means Samp can hold an auction and sell Andersen to the highest bidder.